The seventy years of the Babylonian captivity in the 6th century B.C. are an important and incisive period in the history of the Jewish people. One of the best-known Psalms, 137 (136), known under the opening phrase in Latin as Super flumina Babylonis, is an impressive reflection on the misery of the Jewish people under the rule of King Nebuchadnezzar. He is the Nabucco tp whom the title of this oratorio refers. It is about an episode in the life of young Jewish men, Daniel (Daniele), Hananiah (Anania), Mishael (Misaele) and Azarias (Azaria). They have been given important positions in the country's administration, but refuse to give up their faith in God. This is exposed when Nebuchadnezzar erects a huge statue which symbolizes his power and orders everyone to bow before it. Hanania, Mishael and Azarias refuse, supported by Daniel. They are thrown into a furnace but are saved by an angel from God. Oratorios were usually performed during Lent, and that is reflected by references to Jesus as the Saviour. In this case the three young men in the furnace are not saved by an angel but by Jesus himself. Librettists usually took episodes from the Bible - here from the book of Daniel - with considerable freedom. That is also the case here as in the opening part we meet Nebuchadnezzar dreaming about a huge statue. In the Bible this dream is about a different statue, revealing to Nebuchadnezzar what is going to happen to his empire after his death. The composer is Michelangelo Favetti, about whom relatively little is known. He was born in Palermo at the island of Sicily and was appointed maestro di cappella of the cathedral in Messina in 1682. 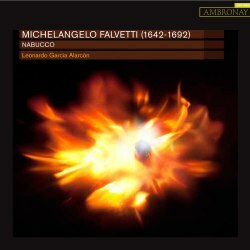 In 2010 Leonardo García-Alarcón recorded his oratorio Il diluvio universale which was reviewed here. It was originally performed in 1682. The next year the present oratorio under the name of Dialogo del Nabucco, was performed. The libretto was written by the same author who also wrote Il diluvio universale, Vincenzo Giattini. It seems that these two oratorios are the only extant compositions from Falvetti's pen. That is a shame because I was impressed by the first oratorio. This second piece seems of equally good quality. It seems that way, because I really can't assess its quality due to the way the score has been treated by García-Alarcón. In his recording of Il diluvio universale he took considerable liberties in his realisation of the score but has gone even further here. Let me try to describe in what way he deviates from the score and from what we know about the way oratorios were performed in those days. This oratorio is for six voices. There are nine roles, but three of them only appear in the prologue. In this recording eight singers are involved; only Mariana Flores takes two roles. In the 17th century oratorios were usually performed with solo voices, without the participation of a choir. Episodes with the indication tutti or coro were sung by the soloists together. The scoring of those passages is not given in the booklet, but I am pretty sure that they are for six voices. Here they are sung by the Choeur de Chambre de Namur, which comprises 21 voices. They even sing in episodes for three voices. The basses of the choir join Arioch at the close of his aria "Udiste, inclite genti" (track 20). They also participate in the quartet of Daniel and his three friends. I can't see any justification for this extended role for the choir nor for its size. Even more problematic is the scoring of the instrumental parts. The booklet doesn’t disclose any details of the original scoring. Oratorios in Falvetti's time were mostly laid out for two violins and basso continuo, sometimes with an additional viola. It seems likely that this is also the case here. In his liner-notes García Alarcón writes: "Contemporary documents speak of Vespers by Falvetti, now unfortunately lost, that were performed by all sorts of instruments". He uses this as a justification for the whole battery of instruments he has mobilized. I find this rather unconvincing. To start with, Vespers were usually performed in church, whereas oratorios - especially those with a text in the vernacular - were mostly performed in other venues, such as aristocratic palaces. It was quite common to add instruments like cornetts and sackbuts to the strings in liturgical music. What kind of instruments Falvetti had at his disposal is impossible to say, as we have no information about the performance practice in Messina cathedral. However, as this oratorio almost certainly was performed somewhere else, it has little relevance anyway. Secondly, the use of additional instruments should be confined to those which were common at the time. The orchestra in this recording includes an oboe which is a very unlikely choice. This instrument made its appearance in Italy not before the last decade of the 17th century. It seems that it was mainly played in the northern part of the country. Here it was introduced from Germany and France and gradually replaced the cornett. It seems highly unlikely that in Falvetti's time the oboe made its appearance in such a relatively remote area as Sicily. García-Alarcón goes much further in that he uses a whole array of instruments which are common in the Near East, inspired - as he indicates in the booklet - by the cultural context of the story of Daniel and his friends. I am absolutely sure that this is far away from anything that was common practice in Falvetti's days. It is even questionable whether Falvetti knew of such instruments. García-Alarcón fails to offer up any historical justification for his choices. The use of an orchestra of more than twenty instruments and the participation of non-European instruments make this performance rather anachronistic. It has very little to do with historical performance practice. Historical considerations apart, it damages the impact of this oratorio. Time and again you hear new colours, sometimes in the background, sometimes quite prominent, or different effects. The instruments distract from the progress of the story. They don't increase the dramatic impact but rather undermine it. Some episodes seem quite dramatic, but they are overshadowed by the instrumental effects. García-Alarcón expresses his admiration for Falvetti, and I am sure that this is sincere. However, his way with the score suggests that he doesn't trust the oratorio's impact on a modern audience. The singers are mostly very good, although Schofrin's low register is a shade weak. They can't save this recording, I'm afraid. The saddest thing is that the quality of this previously unknown oratorio is impossible to assess because it has been undermined by its own advocate.